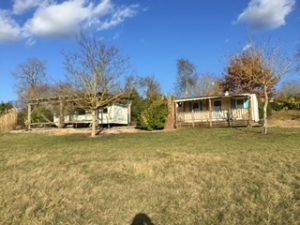 Welcome to the website of Chez Pochou! 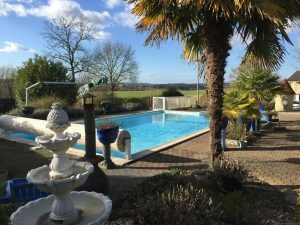 Chez Pochou is our renovated former farm that lies in the département Dordogne in the south of France, about two kilometers from the village of Saint-Aulaye. The farm sits on an area of about seven hectares of land. 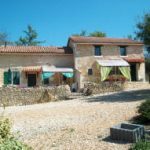 Next to the original farmhouse there are two charming gîtes: comfortable holiday homes nicely converted from two original stone barn buildings. We have named these gîtes after two beautiful flowers: Tournesol and Bleuet. In addition, there are two more gîtes on the property, separated from the other buildings by a garden and some trees. These are comfortable mobile homes that we have named Violette and Marguerite. All gîtes are comfortably furnished for a carefree holiday. Each gîte has a private furnished terrace, where guests can enjoy bird song, the view and beautiful sunsets. And each has a car parking place. You will be able to find all details of the individual gîtes using the above menu options. Smoking and pets are not allowed. There is a 12 by 6 meter heated swimming pool and a children’s playground. Half a kilometer walk takes you to the bottom of our land, where there is a small woodland of poplar trees next to a lovely little stream called le Moudelou. Within the woodland is a picnic table with six chairs to be enjoyed by our guests. A two kilometer ride (or walk) will bring you to the village of Saint-Aulaye that has convenient facilities like a bakery, supermarket, cinema, post office, ATM and restaurant. In addition, it has a nice beach on the river la Dronne with a modest restaurant. Probably it’s needless to mention that the entire Dordogne region has a lot to offer to tourists. Our geographic coordinates are (GPX): latitude 45.1990408, longitude 0.1560793.